We had a productive first day, and got most of our parts done for some of the newer originals that we've been playing live over the last year, including Wishful Thinking, Signs, Loaded Words, Alive, and Get Away. 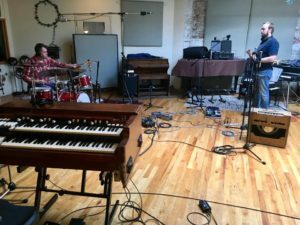 Engineered by Matt Beaudoin, these new recordings feature a whole array of sweet vintage instruments including an old set of Gretsch drums, vintage Hammond B3's and Wurlitzers, and a number of 50's and 60's Fender and Gibson guitars and amps. We'll be spending some more time finishing up these songs, and will be heading back to Q in early 2017 to cut some more new tunes, all of which will end up on our upcoming second LP, which we plan on releasing in late 2017.